MADRIX features 3 main Previews. That means that you can have a look at your effects and visuals before they are displayed on your LED installation. These are live previews and they show everything in real time. ▪ Preview Output - Is located in the middle. This window is a preview of the actual data output that is sent to your interfaces/LEDs. ▪ A MADRIX Preview is a technical representation of your installation. You will see the individual pixels/voxels and how the effects will look on your LEDs, but not realistic renderings of your projects you may know from visualizers. The 3 Previews support a 2D mode and a 3D mode to adequately represent your LED installation. In this way, they are an important part of your workflow when working with your project. 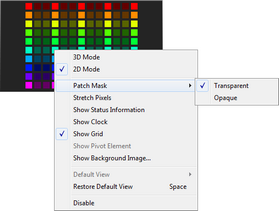 ▪ Go to Previews > Preview Left/Right/Output > 2D Mode to choose 2D mode for the left/right/middle Preview. ▪ Go to Previews > Preview Left/Right/Output > 3D Mode to choose 3D mode for the left/right/middle Preview. ▪ MADRIX can run a benchmark to test your computer's performance with regards to the recommended maximum 3D voxel resolution. You can use the Previews in 3D Mode, even if your virtual LED matrix is only 2D. And you can use the Previews in 2D Mode, even if your virtual LED matrix is in 3D. You have different options of working with each Preview. It depends on 2D mode or 3D mode which options are available to you. ▪ Left Mouse Click And Hold And Move - Click with your left mouse button on a Preview, continue to hold, and move your mouse in order to move and relocate the Preview. ▪ Middle Mouse Click And Hold And Move - Click with your middle mouse button on a Preview, continue to hold, and move your mouse in order to move and relocate the Preview. ▪ Right Mouse Click And Hold And Move - Click with your right mouse button on a Preview, continue to hold, and move your mouse in order to zoom in or to zoom out. ▪ Left Mouse Double-Click - Perform a double-click with your left mouse button to reset the Preview to its default view. This removes any changes, such as zoom or relocation. ▪ Scroll Wheel - Click on a Preview to focus it. Then, use the scroll wheel of your mouse to zoom in or to zoom out. ▪ Space Bar - Use the space bar on your keyboard to reset the Preview to its default view. This removes any changes, such as zoom or relocation. ▪ 3D Mode - Switches to 3D mode. ▪ 2D Mode - Is activated in 2D mode. ▪ Stretch Pixels - Extends the Preview to the full size. The content [i.e., the effects] will also be stretched. ▪ Show Status Information - Provides further information and displays the name of the Preview, the current size of the virtual LED matrix, the current frames per second of this preview [FPS], and which Storage [e.g., S1] and which Storage Place [e.g., P1] are currently selected. ▪ Show Clock - Will display the system time in the preview. ▪ Show Grid - Activates an optical raster separating the single pixels. If the resolution or the zoom level is too high, the grid will not be visible anymore. ▪ Show Background Image... - You may load *.bmp, *.gif, *.jpg, *.png, *.tif, or *.tiff files as background images for your Previews. They will replace the standard gray background color. ▪ Restore Default View - Resets the Preview to the default size and position. This removes any changes, such as zoom or relocation. ▪ Disable - Deactivates a Preview. This can be helpful to save computer resources and increase performance. ▪ Left Mouse Click And Hold And Move - Click with your left mouse button on a Preview, continue to hold, and move your mouse in order to rotate the 3D Preview. You can also add a spin and let the Preview rotate constantly. ▪ 3D Mode - Is activated in 3D mode. ▪ 2D Mode - Switches to 2D mode. ▪ Show Pivot Element - Displays a helpful icon for visual guidance. Three arrows are always shown at position X=0, Y=0, Z=0 [not matter if the Preview is rotated]. The X-axis is red [horizontal; width], the Y-axis is green [vertical; height], and the Z-axis is blue [level; depth]. ▪ Default View - Choose your point of view and the default view for this Preview. ▪ Restore Default View - Resets the Preview to its Default View. This removes any changes, such as zoom or relocation. ▪ Disable - Deactivates a Preview. This can be helpful to save computer resources and increase performance. Especially, 3D mode requires a lot of computer performance. ▪ Clear Message - Only the Preview Output offers this option. MADRIX may show information or error messages in the Preview Output. - x - Discards any messages that MADRIX shows. The messages will not be displayed anymore. The Previews mainly show your effects and visuals. Depending on different settings and requirements they convey additional information. Note: The different scenarios explained below can apply at the same time. When controlling LED lighting, the intensity of the light output makes up a large factor of the light design. The Previews will represent your intensity settings. One of the main features of MADRIX is that it renders visuals and effects live in real time. Regarding the overall performance, you can define a specific setting in the Options that will also influence the Previews. Depending on your settings, MADRIX will include all voxels in the rendering process or only the ones that are patched. When letting MADRIX render all voxels, you can further decide how the Previews work. Voxels that are used [a fixture is set up at this position] are displayed brighter than voxels without LED fixtures. Compared to this, MADRIX offers two choices in order to show or hide voxels that are not used. This will influence all 3 Previews. Positions without fixtures will be dark gray or they will not be shown and set to black. Note: The Patch Mask will only fully apply, when your performance settings include all voxels, as explained above. If your performance is set to only include patched voxels, the voxels will always be shown opaque. Changing the Patch Mask setting will not influence the Previews anymore. The Previews will indicate if you are using a higher output [as set by the virtual LED matrix in the Matrix Generator or Patch Editor] than your MADRIX license version provides. Unlicensed areas will be shown darker. Select Help > About... to check your MADRIX license version and product serial numbers. When setting up an individual Patch in the Patch Editor, there might be areas where no fixtures are located according to your LED installation. These areas without any fixtures will automatically be displayed darker to indicate that this area is not in use. You can change further settings of the Previews. ▪ When running MADRIX for the first time, you will be asked to perform a short benchmark test for the Previews. ▪ Since using the Previews in 3D Mode can require a certain computer performance, MADRIX allows you to run the Benchmark to see the recommended maximum 3D voxel resolution for your computer. ▪ It is recommended to run this test once for your computer setup. ▪ Please close other programs, windows, and background tasks during the test since they can negatively affect the performance and outcome. - MADRIX mainly uses the computer's main processor [CPU] for the effect rendering process. - MADRIX mainly uses the computer's graphics card [GPU] to display these effects in the Previews. - The Benchmark evaluates the performance of the computer system regarding the Previews. This means that it mainly tests the performance of the graphics card. - The Benchmark result does not necessarily represent the overall computer performance. 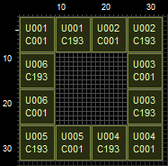 The CPU might be able to handle a higher resolution than the graphics card can display smoothly in the Previews. - The Benchmark evaluates the performance of the Previews in 3D Mode. The result of the Benchmark will show the total number of voxels your computer should be able to display with sufficient performance when using one or more Previews in 3D Mode. - The Benchmark result does not represent the performance for 2D. - You can save overall computer performance when using a 3D Matrix Size by setting the Previews to 2D Mode. - The Benchmark result does not refer to each Preview independently, but for all Previews in total. That means by default it is assumed that all three Previews are enabled as well as set to 3D Mode. - The Benchmark result is an information. It shows what is recommended and not necessarily what is possible. The 3 Preview windows explained above are technical representations of the effects MADRIX creates for you. But they are not pixel-perfect outputs. DVI is another way to work with LED products which requires such a correctly sized output. To use DVI, MADRIX offers other options. DVI output allows you to easily control large LED pixel walls or use screen-capturing, for example. ▪ The graphics card might be too old and might not support OpenGL 2.1. ▪ The driver of the graphics card for the Windows operating system might be outdated. ▪ Check if your computer's graphics card supports OpenGL 2.1. If it is not supported, your computer/the graphics card does not meet the minimum requirements of MADRIX 3. Please upgrade to a newer graphics card, which supports OpenGL 2.1.